People ❤ Video. We help you create one. Virect began in 2011 when a software engineer needed to make a product video. After countless hours comparing portfolios and pricing, filling out contact forms and endless google searches, he came up with a plan: one place for all video production needs. Virect’s platform now features over a thousand video professionals around the world and has helped big companies and startups alike get new video content. Our goal is to connect you with the best video partner for your project – on your budget and timeline. Tell us what kind of video you’re looking for and your budget. Not sure? That’s ok. Schedule a free consultation with a Virect representative and get creative support. Once your project is posted, you’ll get proposals from our community of talented professionals. View their portfolios, interact using Virect’s chat and call features, and select the creator that best meets your needs. Your Virect representative is there to help you along the way with recommendations and feedback for your project. * No payment is due until you’ve hired your video pro. For your convenience, we have built a workroom to share ideas, files and concepts for your video production. Using this space can help keep your creative ideas flowing and help prepare you for the filming and editing process. 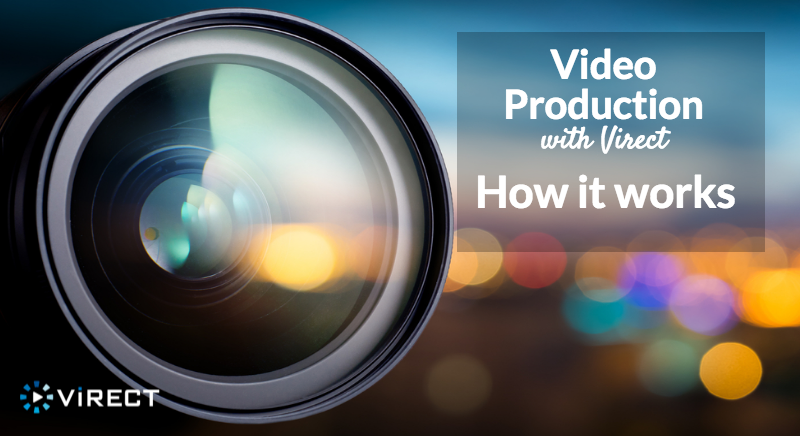 Rest assured the Virect team is here to help ensure that you have all the tools you need to create a great video. Once you’ve finalized details with your video professional, you’re ready to start filming your project! Or, you’re ready for your animator to begin drawing. This is the fun part. Finalize your video (Post production). The footage is captured, and the editing process begins. Use the Virect workroom for your convenience to share information and approve the final edits to your video. Payment schedule: no hassle, no surprises. Half of your project’s total will be due at the beginning of your project to hire your video partner. The remaining half will be due once your video is finalized and ready for distribution.